Soft, soft, soft...and its undyed color is environmentally friendly to boot. This 100 % Merino yarn, in rare natural colors, was designed by our shepherd and crafted at a small American mill exclusively from the wool of our natural colored Merino sheep. No dyes were used in the creation of this yarn, that was done by the sheep alone. Unlike alpaca, natural colored Merino is extremely rare because Merino breeders for centuries have been culling color from their bloodlines in order to attain the whitest of whites, so these natural colors are truly special and extremely unusual. Pictured is a luxurious little diaper cover knitted from another color of this yarn. Lovely! This yarn features beautiful drape, and displays the gorgeous cool cinnamon of our small moorit flock. . The core is Merino, the wrap is finely spun Merino. Sold in skeins of approximately 5 oz each. There are 175 yards per skein, 6 to 7 wpi. 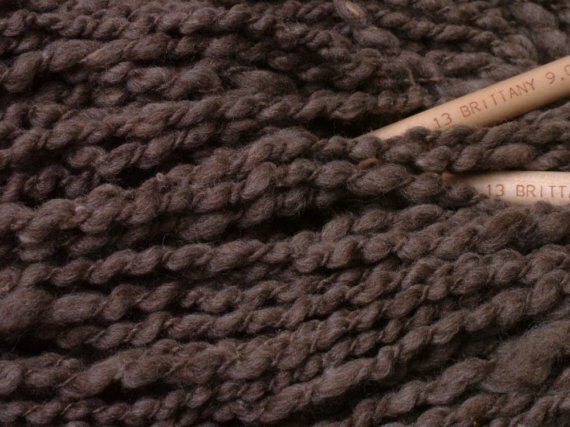 Similar to many handspun yarns, this yarn has a somewhat "thick and thin" construction. 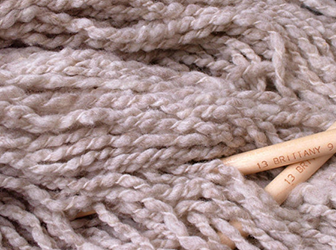 It lends itself particularly well to the knit-then-felt technique, as the main core yarn has very low twist, and felting will help to protect against any possible pilling. See the photos our other undyed natural colors and mix and match for your next very special project! Please note that colors shown vary by monitor, so my written color description is the most accurate. The McMurry family, founders of Humble Hills Sheep & Wool/Genopalette are proud to be dedicated contributors to an intensive 30 year international endeavour to produce raw white and natural colored handcraft fleeces of the highest quality, for the discriminating craftsperson. Cleanliness is one of our highest priorities. INTERNATIONAL BUYERS: Please contact me for your actual shipping cost BEFORE purchase. International buyers are responsible for knowing their country's customs regulations. PRICE LISTED is for USPS surface mail rate shipping. Please contact me for other shipping options. IF YOU WANT TO COMBINE PURCHASES please contact me for an actual shipping cost. FOR ITS PROTECTION, this wool yarn will ship in a USPS priority shoe box to locations within the USA. International mail will ship via surface mail unless otherwise requested by the buyer. I refund shipping overages of $1 or more. Thanks for looking! This Product is currently Out of Stock, please check back later.